Since a couple of months Armourfast has become a stand-alone company (whereas previously it used to be under the umbrella of Hät). I don't know if there is a link to that change, but the latest edition of the Armourfast T-34/76 kit has been substantially reworked and is now dimensionally far more accurate than it used to be (although still with some issues, as we will see below). Detail has been improved at the same time. Left: the rear of the box for the retooled kit showing the sticker with the manual for the retooled kit, which I peeled off to show both new and old..
Not surprisingly, the kit is very similar to the Armourfast T-34/85, reviewed earlier, to which I would like to refer the reader for more pictures. The hull is a two piece affair, to which the, MG mount, rear engine deck, exhausts, fuel drums and driver's hatch have to be added. (The hull is solid underneath the latter, by the way.) These fuel drums actually took me more time to assemble than the remainder of the kit, as they are split lengthwise; the resulting seam at the ends is quite difficult to fill without damaging the parts. 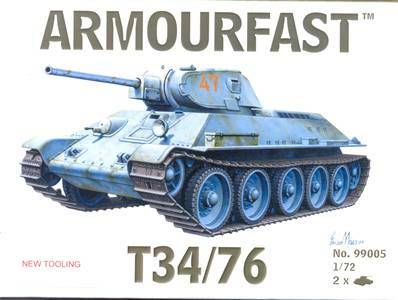 Apart from this, I also believe that few T-34/76 with the early single-hatch turret had any of these barrels, while the kit would have you add two. As I understand the first external fuel tanks were angular boxes added to the rear plate; the cylindrical fuel tanks only appearing with the T-34/76 versions that were equipped with the hexagonal turret. A retrofit would be plausible however. 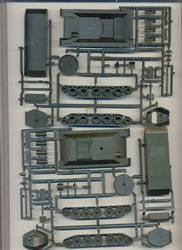 The casting flaw found on the tracks of the T-34/85 kit I assembled earlier was not as pronounced in this kit, so you might want to take a look inside the box when you buy one to see if that one has the flaw or not. 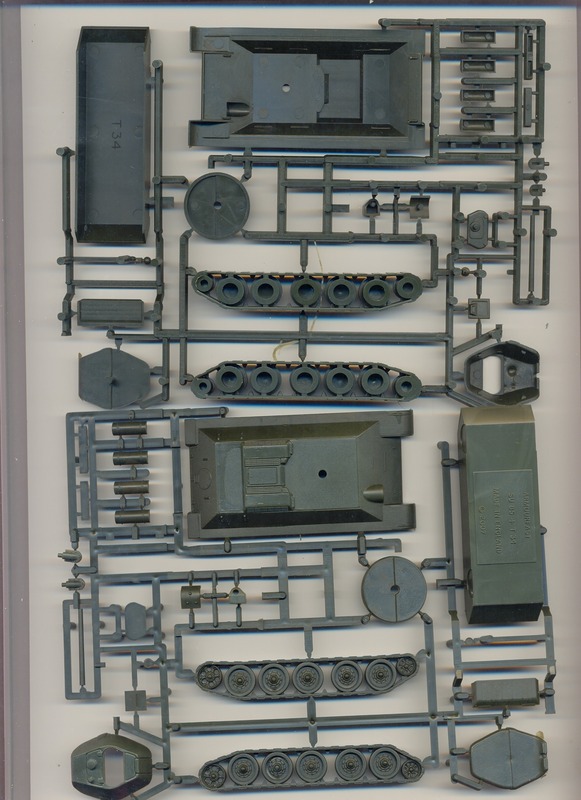 These tracks are very simple representations of what was found on the real tank. 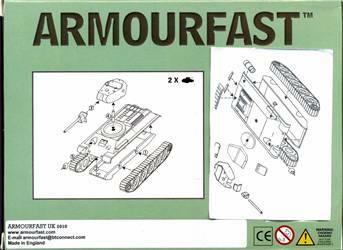 Actually, I can live with the simplifications made by Armourfast to cater for the wargaming community, but the simplicity of these tracks is, in my eyes, one step too far. Giving them just that little bit more detail wouldn't make assembly any more difficult, the finished kit any less sturdy, but would result in a model that comes close to the simplest of display models. I am not sure if all these features are consistent, but it would make it look like a T-34/76 Model 1941 from Zavod 112's Spring 1942 production batch. If so, then the fuel drums are suspect. I believe these were only introduced in 1943, and if two were mounted then they were mounted in a staggered way. What is surely missing from the kit are the vision ports on the side of the turret, though. Too bad; it's a distinguishing feature and it is shown on the boxtop. I took the time to measure the kits against plans in  and  (which differ quite a lot between them) and found that the hull is slightly oversize, being close to 1/68. 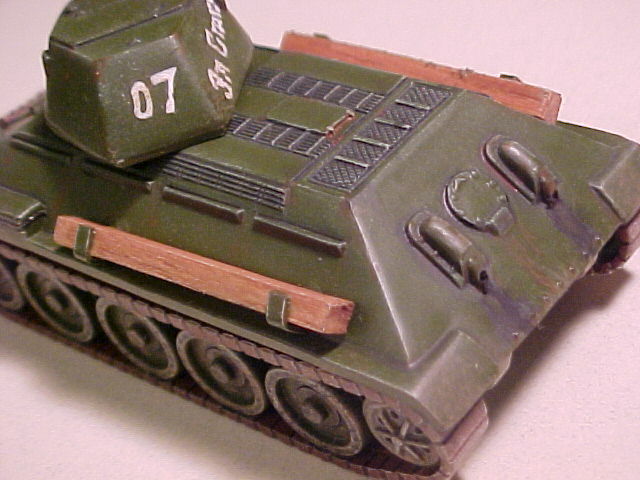 The turret has it own dimensional issues: gun length is in the vicinity of 1/68 and turret height near 1/61. The turret body is a tad too short, say 1/75, which compensates somewhat for the gun length. Turret width is near to 1/74. I also noted that the turret body is slightly offset with respect to the turret ring, so that it is slightly asymmetrically placed atop the hull, which I don't think was the case on the real vehicle. No decals or painting instructions are provided, although the boxtop can serve as a guide. Below are pictures of the kit, after construction and with a coat of grey primer. Below is a picture of the earlier release. I believe it speaks for itself. Picture from Henk of Holland website, used with permission. Higher resolution pictures can be found here.